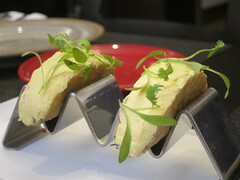 It isn't often I walk into a new restaurant with no expectation and come out wowed. That happened recently to me at the new Towne in downtown LA. I didn't know much about it coming into the media tasting other than that they make their own twinkies, but left pretty impressed. 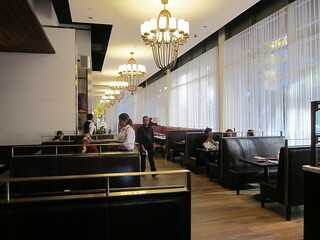 Towne is a large elegant restaurant in the WaterMarke Tower in the South Park district of downtown LA. The bar to the left and the pastry case near the entrance is Bottega Louie-esque, without the high ceilings and the loudness (at least so far). 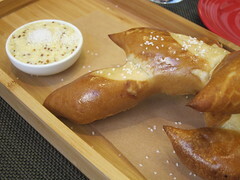 The warm pretzel bread, complimentary for the table, served with mustard butter made a great first impression. While you can't see if at first glance, the crispy shells were filled with chunks of fresh kanpachi. The head barman here is Jason Bran, who has designed a cocktail menu ranging from little twists of some classics to some fun, completely out-there cocktails. 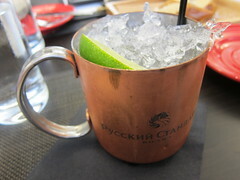 More on that later, as we first started on the tamer side with Eastern Mule: Russian Standard Vodka, lime, house 5-spice ginger beer ($13). The hint of the spices were subtle but unmistakable. 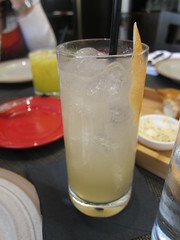 Another nice refreshing classic: Genesis Collins with Beefeater 24 gin, grapefruit, honey, soda, "invisible touch" ($13) - not sure what the invisible touch was.. 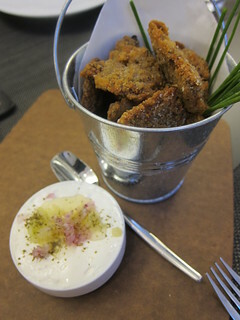 If you like chicken liver and pates, you would certainly love these deep fried goodness (one of the other bloggers at the table just could not stop eating them)! On the other hand, if you don't like the taste of liver, avoid this. Just because they're deep fried doesn't mean they've lost that liver taste!